지방간 환자들이 '진료'를 받을 필요가 있을까요? 이런 의문을 제기하신 분이 있습니다 (Burch, PLos Med 2014). "Does diagnosing Fatty liver and chronic kidney disease do more good than harm?" 같은 분이 다른 각도로 이런 질문도 하셨습니다 (www.slate.com). "Foie gras-essentially fatty liver-is delicious. Is it a disease?" 바쁘신 분들을 위해 한 문장을 옮깁니다. "Staying alive as long as possible is great, and worrying about illness is reasonable, but all life is limited and it's important to enjoy what we've got. Health, like beauty, is terrifically subjective. Tell someone who's feeling fine that they've got fatty liver disease, and you're subtracting from their sense of well-being. Maybe not much, but you're doing so all the same, and I'm not sure it's merited. Remember that shady border between intruding on freedom and promoting health? You may have just crossed it"
이런 철학적인 문제는 잠시 뒤로 하고, 어쨌든 진료실로 온 '지방간' 환자 아니 지방간이 있다고 들은 분께 우리는 어떻게 하는 것이 좋을까요? 여러 접근 방법 중 가장 최근 발표된 유럽간학회의 비알코올성 지방간 권고안의 algorithm입니다 (J Hepatol 2016). 단순 지방간인지 지방간염인지 구분이 필요합니다. 이때 일차 검사로 비침습적인 혈청 fibrosis marker를 권했습니다. 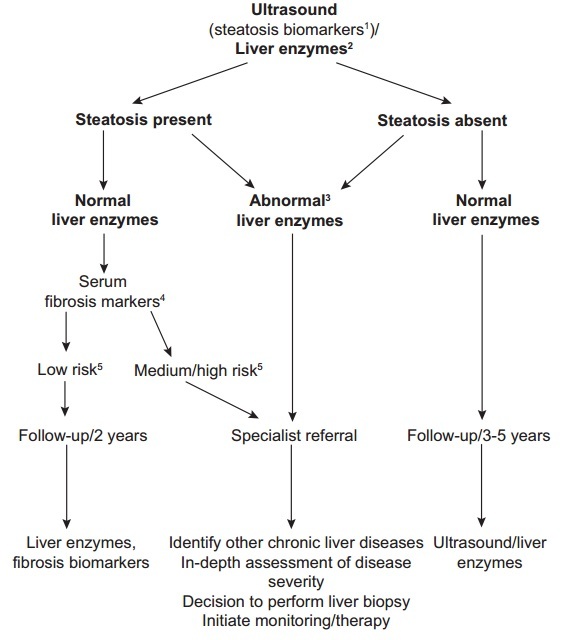 가장 잘 알려진 것은 NAFLD fibrosis score입니다. 인터넷에 calculator들이 아주 많습니다. 검사상 -1.455 이상이면 섬유화 가능성이 높으므로 주의해야 합니다. 섬유화가 동반된 지방간은 간질환 전문가에게 의뢰하는 것이 좋을 것 같습니다. 섬유화가 없는 단순 지방간 환자, 즉 일차적으로 'life style modification'이 권고되는 분들에게 어떤 설명이 중요할까요? 아래는 대한 간학회 비알코올성 지방간 치료 권고사항입니다. 식이에 관한 중요한 자료 및 이에 따른 권고안은 아래와 같습니다. 1. 같은 칼로리에서도 high surgar는 간내 지방침착이 심합니다. 간식하지 마세요 (Koopman. Hepatology 2014). 인공당분(액상과당)이 들어간 청량음료, 과일주스 등에 유의하세요 (Jun DW. Korean J Gastroenterol 2013). 2. 저탄수화물 식이를 하세요 (Bazzano. Ann Intern Med 2014). 3. 운동하실 때 근력운동을 같이 하세요 (Bacchi E. Hepatology 2013). 신동현 선생님. 오늘도 많이 배웠습니다. 한 가지 걱정은 '저탄수화물 식이'입니다. 그렇지 않아도 쌀이 남아도는데 다들 저탄수화물 식이를 한다면 농민들 시름이 깊어질 것 같습니다. 쌀은 먹고 밀가루를 줄이는 방향이 좋겠습니다. 단순당분을 자주 먹으면 지방침착이 잘 옵니다. 논란이 있지만 vitamin D 결핍은 지방간 발생에 좋지 않습니다. 간질환 2 대 난제가 있다고 합니다. LiverTODAY의 fatty liver와 연관해서 질문드립니다. NAFLD 에서 NAFLD fibrosis score check이후 -1.455 이상이면 간질환 전문가에게 의뢰하라고 하셔는데요, 의뢰하면 보통 어떤 검사와 치료 및 follow-up이 이루어 지나요? P.S NAFLD 에서 NAFLD fibrosis score check이후 -1.455 이상이면 간질환 전문가에게 의뢰하라고 한 적이 있습니다. EASL(유럽간학회) 권고안입니다. 이것에 맞추어 아직 의뢰를 받아본 적은 없습니다. 하지만 이런 분들은 NASH가능성이 높다는 뜻이므로, 저는 refer를 받는다면 fibrosis정도부터 정확히 확인하는 작업을 할 예정입니다. Liver fibroscan, liver biopsy의 고려 대상이 될 것 같습니다.